For most of my life, I thought I had very dark brown eyes, almost black. After several decades of wearing strong hard contact lenses, I eventually stopped and freed my eyes to learn to see naturally. The contacts had a grayish tint when I took them out, just from being so thick. Now I could really see my eyes, uncovered and unhidden. They are dark brown, but definitely not black — my black pupil is much darker than my iris. The contacts hid the true color of my eyes from me and the rest of the world. This feels like a metaphor for hiding my true self. When I started vision improvement, my eyes looked scared to me, a bit overwhelmed, as if there was too much to deal with. Now I’d like to think they look kinder, not so defensive. I’m also noticing that my eyes are gradually opening wider, letting in more light so I can see better more naturally. I’m paying close attention, catching myself when I start to pull in the corners of my eyes and begin to squint. Then I gently remind myself I can see more if my eyes are wide open, and relaxed, not trying. 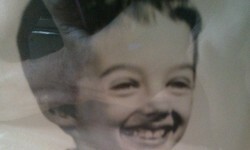 The picture is me at about 5 years old. I remember the school photographer asking me to take my glasses off, and probably telling a little joke to elicit this smile. I see this as a reminder of how free I can be without glasses, letting my joy out and being who I really am. My eyes and forehead are relaxed here. I visualize this photo sometimes to remind my body and mind that I already know how to keep my visual system in a happy calm state. One of my vision teachers, Dr. Marc Grossman, has a degree in Chinese medicine as well as one in optometry. In workshops he has people look in a mirror at one eye at a time, to see what they feel and perceive. He says the right eye is the Father Eye, storing emotions about your father or other males in your life or about being a male yourself. The left eye is the Mother Eye. Some people find major differences between their 2 eyes, perhaps “My right eye looks like it’s angry at me, and my left eye looks cold and withdrawn”. Doing this exercise yourself might lead to some interesting insights about you and your history, so I invite you to try it. The flip side of this is how you feel looking at your eyes. These precious under-appreciated organs work so hard for you! Do you look into the mirror at your eyes with resentment, annoyed that they aren’t seeing perfectly? Are you impatient that they seem to need rest, when you want to push them and get more work done, right now? Are you dismayed that they show your sadness to the world, when you’d rather hide that and pretend you’re “fine”? We’ve all heard that the eyes are the windows to the soul, and I do think they’re an indication of the health of a person, both emotionally and physically. My energy medicine teacher Deborah King tells us to look at a client’s eyes for an initial read on how she or he is doing, and what might be going on with the person. The whites of my eyes (the sclera) is clear and bright now, when it used to be slightly bloodshot, all the time, from the irritation of the thick contacts. My eyes are softer-looking to me too, not bulging forward with that myopic “Give me that clear image!” desperation. When you look into a mirror, what are your eyes saying to you? Like beloved friends, they are doing their best for you, so please treat them well, and appreciate them. Shining eyes indicate a shining spirit. Don’t deprive us of seeing yours! Next Next post: What Causes Tired Eyes?